A Good Elasticity with Steady Squeeze Sound: The dog ball with sound is just the right weight with enough heaviness to throw far, no extra strength needed to play with, it is ideal dog daily toys. With built-in a special sounder, this ball can produce the instant sound to grasp the dog's attention and excites the dog when chew or press it, and also bounce and allow your dogs keep playing it and have a joyful life. The Unique Rugby Design and Bright Color to Grasp Dog's Attention: The unique Rugby-shaped design, lovely and flexible to play with, the bright color is most suitable for the dogs chewing or playing with, have fun with it and meanwhile improve their intelligence and agility, prevents boredom and creates happy dogs when we are out or not around the dogs. Build More Healthy Chewing Habits: This dog treat egg can help the dog to build healthy and non-destructive chewing habits instead of chewing the shoes/furnitures, have more happy and healthy dog. Also a great agility trainning tool and interactive toys with our dog friends. Easy to be cleaned and Keep Fit for Your Dog: This squeaky ball is washable and easy to be cleaned with worry free. The dog will like it and improve its health via running, chewing and doing sports daily. High Standard Eco-friendly Safe Materials: This dog ball is made of high quality and food-graded materials, environmental and non-toxic. It is gentle on a dog's mouth and dog owner's hands, but also super strong and durable, can offer safety of dog bite for chew toy purpose. LIFETIME PRODUCT WARRANTY (MONEY-BACK OR REPLACEMENT): 100% satisfied GUARANTEE, no query asked refund or replacement (Just feel free to contact us via Amazon message if you are not 100% satisfaction). Bev's dog Rolo is ball crazy, so I thought he was the ideal candidate to review these squeaky rugby balls for us. 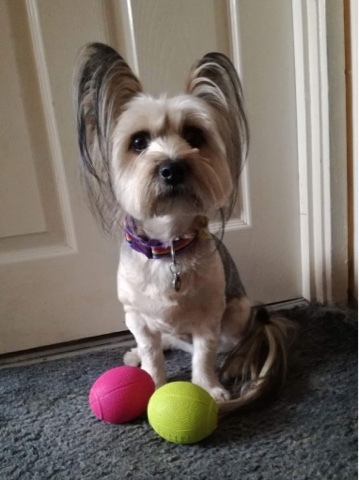 The LaRoo squeaky balls come in four different colours - blue, orange, pink and lime green. 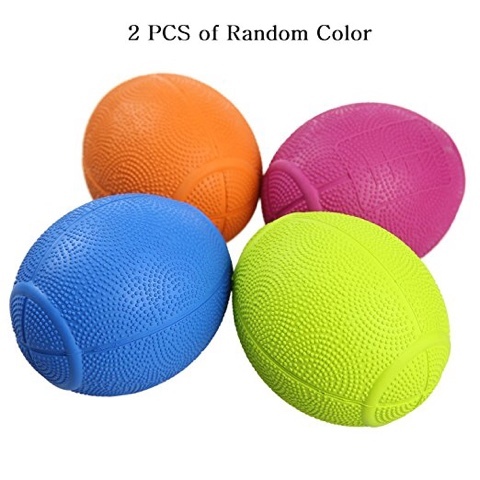 Unfortunately you are unable to choose the colours you want, you are sent two randomly coloured balls. 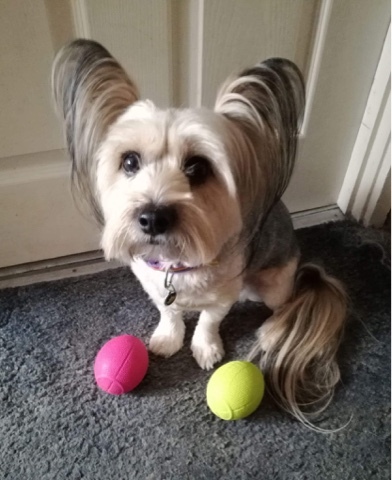 Rolo received a pink ball and a lime green ball. I expected Rolo to love these toys, but unfortunately they were too heavy for him to pick up (he's a chihuahua cross Yorkshire Terrier so he's quite a small dog). They were also too heavy for Dottie the chihuahua and Scooby the Pomeranian. Bev feels that due to the size and weight of these balls, that they would be much better suited to larger dogs. There are some definite positives about the toys though. The colours are lovely and bright so they are easily spotted in the grass when you throw them. They are also very bouncy, and as they are rugby ball shaped they bounce in random directions which is great fun for the dogs. Although Rolo and his brother and sister couldn't pick the balls up, they did enjoy chasing them around the garden when they were thrown for them. The toys look to be quite tough but the dogs haven't tried chewing them so we can't comment on how long they'd last with a dog that chews toys. Overall we wouldn't recommend the LaRoo rugby balls for small dogs, but larger dogs would enjoy them as they are fun and very bouncy. I do feel that the price is a bit high - £12.99 for two squeaky balls seems quite expensive to me. Bev and Rolo have given the rugby balls three out of five stars.